Starting around Thanksgiving…. and going through the end of December…. I am going to include/encourage everyone to share their outdoor AND indoor Christmas decorations for Outdoor Wednesdays. This week…. I want to share my daughter’s Harry Potter tree. She had a lot of fun making some of the decorations that went on the tree. She made miniature books, potion bottles and brooms. She even bought an angel for the tree and took it apart and redressed it! I think she did a great job on her first themed tree! This week..the stairway, hallway, and master bedroom and bathroom! and the hallway…. more nutcrackers! and the master bedroom … the bed…. and a wreath on the door…. next week.. the kids rooms! This week..the kitchen, entry, and half bathroom! First, the kitchen … and the reindeer tree…. The half bathroom…gone to the doxies…. next week.. the stairway, hallway, master bedroom and bathroom! 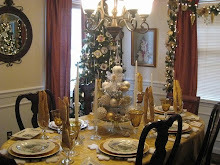 More Christmas décor this week… This week the dining room! a closer look at the table…..
Family photo tree # 1…..
and family photo tree # 2…. and the angel tree by the back door…. next week..the kitchen, entry, and half bathroom! The boxes… oh my…. my kids brought ALL the boxes down… but then I had to empty them and decorate each room! and the after…. of the living room…. A closer look at the living room… from the front door…. a closer look into the china cabinet…. next week… a closer look at the dining room….